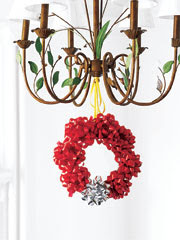 Purge your saved bow collection by making this easy wreath with the kids. We made one last year and put it up in the playroom. Cut out the center of the plate. Glue the bows around the remaining plate rim. Hang where the kids can see their creation.